On investigation, complete hemogram showed elevated erythrocyte sedimentation rate (ESR) and normocytic normochromic anemia. C-reactive protein level was elevated. A sputum stain for acid-fast bacillus was negative. GeneXpert was performed, and the result was negative. Tests on antinuclear antibody and anti-ds-deoxyribonucleic acid (DNA) antibodies were negative. An echocardiogram showed mild pulmonary arterial hypertension. A Doppler study of the neck vessels showed an occlusion of the innominate, left common carotid and the left subclavian arteries (LSCA). 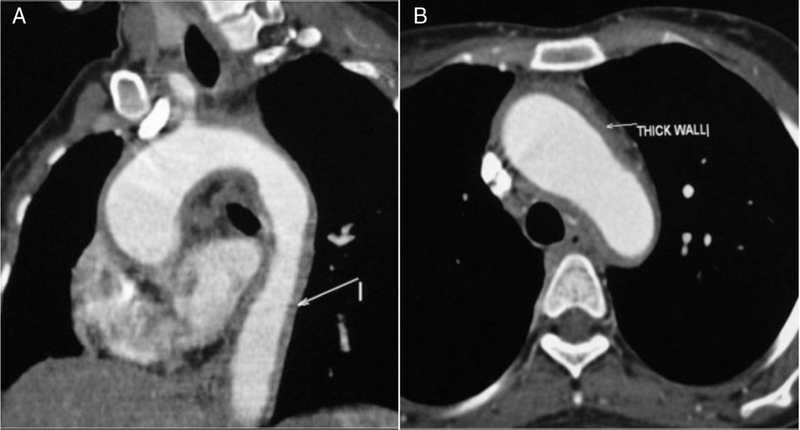 Computed tomography (CT) aortogram was performed, which showed diffuse wall thickening and an enhancement of the ascending and descending thoracic aorta and the aortic arch [[Figure 1]A and B]. The innominate artery and the bilateral common carotid artery (CCA) showed a thickened wall with occlusion [[Figure 2]A]. The right CCA showed gross thickening with an enhancement of the wall up to the bulb. The left CCA showed long-segment stenosis from origin. 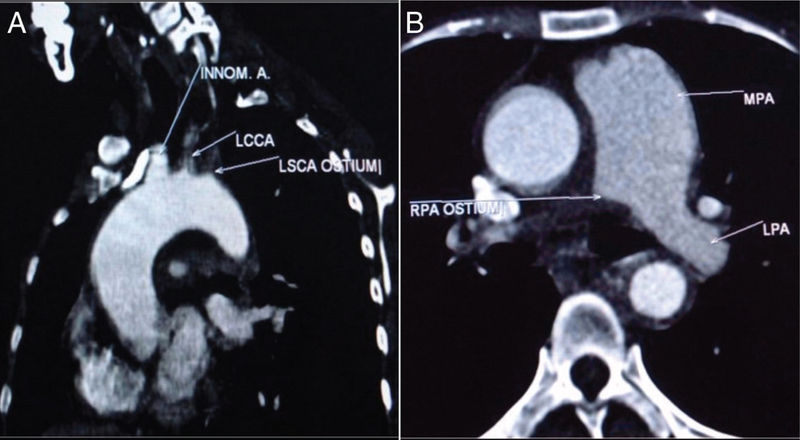 There was total occlusion of the right subclavian arteries and LSCA and from origin, and the pulmonary trunk was dilated with an occlusion of the right pulmonary artery [[Figure 2]B]. The abdominal aorta was normal. Chest X-ray and high resolution computed tomography (HRCT) thorax were normal [Figure 3]. Yamato M, Lecky JW, Hiramatsu K, Kohda E. Takayasu arteritis: Radiographic and angiographic findings in 59 patients. Radiology 1986;161:329-34. Sharma S, Rajani M, Talwar KK. Angiographic morphology in nonspecific aortoarteritis (Takayasu’s arteritis): A study of 126 patients from North India. Cardiovasc Interv Radiol 1992;15:160-5. Liu YQ, Jin BL, Ling J. Pulmonary artery involvement in aortoarteritis: An angiographic study. Cardiovasc Interv Radiol 1994;17:2-6. Panja M et al. Long term follow up of Takayasu’s disease. J Am Coll Cardiol 1997;29:218A. Kuratomi Y, Araki T, Arai T, Kira S, Fukushima K, Kimura S et al. A case of Takayasu’s arteritis with recurrent massive hemoptysis. Jpn J Thorac Dis 1981;19:331-6. Rocha MP, Guntupalli KK, Moise KJ Jr, Lockett LD, Khawli F, Rokey R. Massive hemoptysis in Takayasu’s arteritis during pregnancy. Chest 1994;106:1619-22. Qanadli SD, Sissakian J-F., Rocha P, Piette AM, Lacombe P. Takayasu’s arteritis. Circulation 2000;101:345-7. Elasser S et al. Int Rev Thorac Dis 2000;67:213-5.